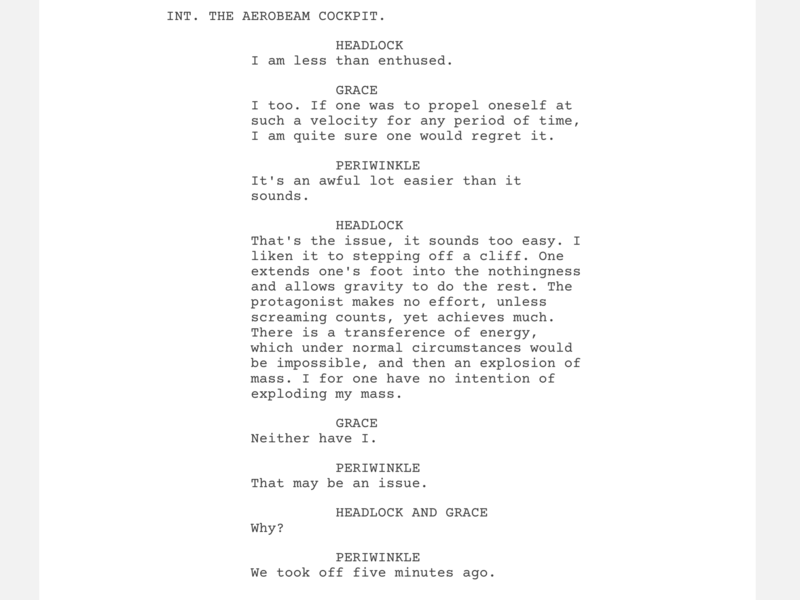 Author’s Note: I was recently treated to an app that makes scripts from your notes. I have found this a real joy to use as I can pour myself into dialogue whenever I like and the whole thing comes out clean for later use. In fact, I can’t stop. Here is a little scene from my WIP. The great Victorian investigator Mortimer Headlock, and his associate Miss Grace Grace, are inspecting Albion’s latest aeronautical device. The aeronaut, Clarence Periwinkle, is their host. Of Headwear and Social Etiquette. A Perkin Perkins Steampunk romp. Another social gathering at Buckingham Palace and manservant to the Royal Household, Perkin Perkins, is on yet another hiding to nothing. “Does that explain anything?” The Queen’s eyes blazed ruby anger from behind her owllike goggles. Perkins bowed low and marched over to the giant of a man in question, his walrus moustache the only feature of note protruding from his underpants headwear. A whisper in his ear, inaudible to all else, and the Frenchman set to gesticulating, as is their way. Once he’d had enough, he allowed Perkins to lead him from the room and away from a hundred prying eyes, the gentry and usual toffs allowing their upraised noses to communicate their displeasure. Only when long gone did the Chief Scientist of the Ministry for Empirical Advancement, one Sir Magnus Monk, sidle over to his monarch. “What is it, Monk?” Snapped the Queen. Sir Magnus sidled off in his Quasimodo way, aquiline nose to the ground and hump raised. He said he searched everywhere much to his monarch’s anger when he eventually returned. And to be fair, he had. Other than the Palace’s cellars, a cold, dark place where a man with a walrus moustache sat drinking with a manservant, both of whom wore their underpants on their heads. The very wonderful author Julie Northup has kindly interviewed me about my current work in progress. If anyone would like to read about my future Steampunk project, its main characters and what will follow, please feel free to click HERE. You’ll see why I’ve not been here so much. Author’s Note: This is a scene I have decided not to use from my latest Steampunk Fantasy. The beautiful Miss Grace Grace has fallen foul of the evil Sir Magnus Monk, or so he thinks. Sir Magnus Monk sneered the sneer of a lecherous old goat and ran one dirty, chipped fingernail along his prize’s cheek. When the ropes Monk bound Miss Grace Grace with slipped to the floor with a gentle hush, her knee making contact with parts he’d rather have not shared, doubling the hunchback over so his nose brushed the mouldering carpet, she returned his sneer with a rather more elegant contempt. With that, Miss Grace Grace rose to her feet like the lithe beauty she was resplendent in her always canary-yellow garb and exited the room. She did not look back. The little bird had flown. I’m so pleased and relieved to have just finished editing what will in a few months time be released as Britannia Unleashed that I thought I’d share a passage. I have spent the last three years editing The Eternals Series and this and for the first time in as long can now start writing again. (THANK GOD!) I have big plans for the Britannia books. Big, big plans! From Britannia Unleashed section: A Certain Release. Note: Britannia’s greatest investigator, an ageing Mortimer Headlock, is led to a dilapidated mansion by a lady that is not quite a whole woman. Here he meets a foe from his past. A dead foe! Stocked with more paraphernalia than Headlock had ever seen in one place, the mansion mired in mismanagement. He glanced into what appeared a dining room and back across the hall to what might have passed for a lounge, both cluttered from floor to rafters with junk. Piles and piles of miscreant objects littered every surface with none left bare. The lounge was worst with the accumulated garbage almost touching the ceiling. Great heaps rose from the carpet, tables and chairs like a London cityscape reimagined in miniature with only one area, darker than the rest, ominous by its excavation. Something resided in that blackness; two glittering eyes confirmed it. Headlock noted them but said nothing, there would be time for such things later. “Shall we take a seat?” No-Name enquired. “Lead the way, Madame,” he replied. As he suspected, she led him away from their fellow resident. Holding aloft the lantern more for himself than No-Name, Headlock followed her through the warren that was her father’s home. It was here that he imagined a reasoning for his companion’s strange gait. Whereas Headlock stumbled and bumbled into this item and that, a straight passage elusive, causing commotion after commotion of tumbling junk, she tottered between the stacks of papers, plants, furniture and more bizarre items like a world champion in avoidance. Her tottering seemed perfect in its side-to-side rotations to make haste through the accumulated detritus. Headlock’s longer strides were less so. “Very. As a rule, the spirits of the deceased come and go at will. However, in my experience of such things, they almost always require something before departing.” Headlock found himself tapping the one bit of exposed table top for dramatic effect, his fingertip orchestra echoing around the room. She opened her small almost circular mouth to elaborate when something interrupted her. “Headlock,” said a disembodied voice. “Headlock,” it came again shaking the room’s wooden beams with its depth of bass. And the proverbial penny dropped.